As your baby grows older, you can see that he is starting to exhibit his own distinctive personality. He may start showing certain marked preferences, especially when it comes to food! Some of these may go away in time, while some may stick. Since we’d all like our kids to grow up enjoying their vegetables just as much as their burgers, it makes sense to start young! 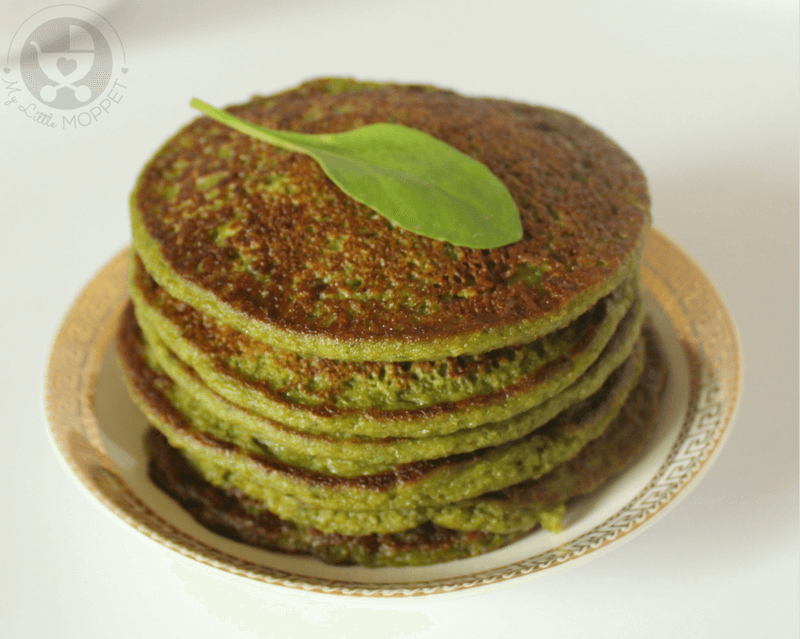 Today’s recipe is one such attempt to make your baby a greens-lover – Spinach oat pancakes! The beautiful green color, the nutrition of spinach, banana and oats along with an easy to eat texture – what more could a Mom ask for? 1. In a grinder jar pulse the oats to powder. 2. Add washed spinach leaves and tender stems along with over ripe banana to the same grinder jar. 3. Pulse 3-4 times, to get a smooth batter. Add water as required. The batter should be not very runny, nor too thick. It should resemble a dosa batter. 4. Heat a non-stick pan. Drizzle some oil. 5. Put a ladle full of batter in the center and allow to spread. You may flatten it slightly with the back of the ladle. Do not spread much. 6. Cover and cook. The pancake will rise a little. 7. 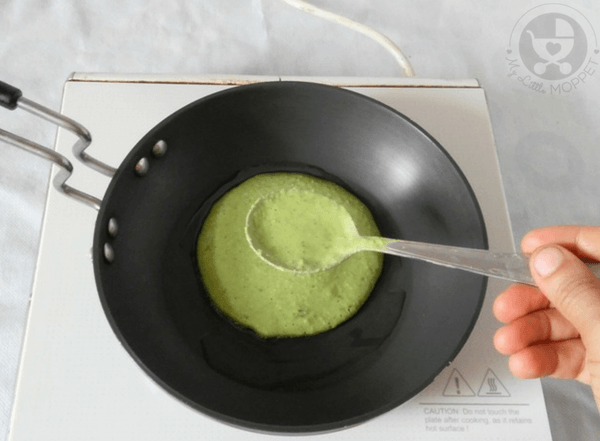 Flip the pancake when light bubbles start to form. Cook the other side uncovered. 8. Make all the pancakes similarly. Serve warm with some honey or as it is. 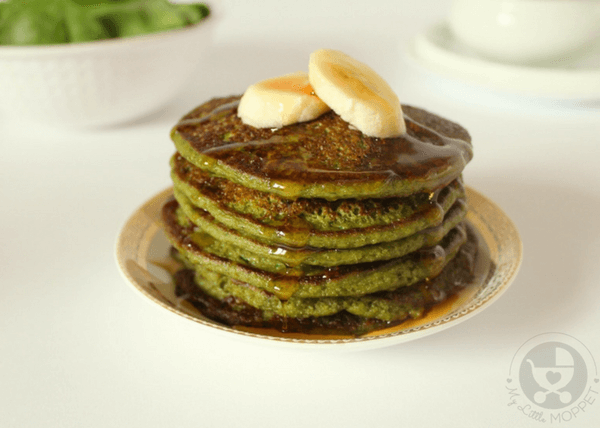 As you can see, these Spinach Oat pancakes are gluten free and vegan. 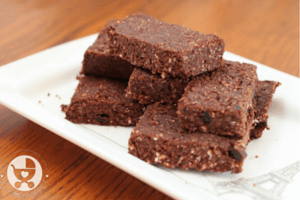 It is also salt, sugar and egg-free, with the banana acting as both as an egg substitute and as a natural sweetener. This can be given to babies after 9 months of age. 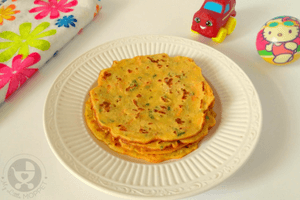 The bright green will also make these appealing to older kids, and you can serve it with honey to make it more interesting! 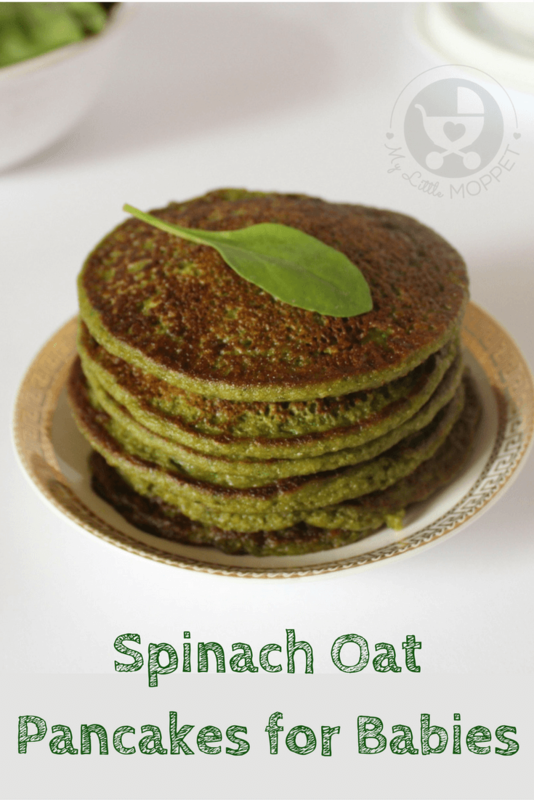 Give your baby a healthy, nutritious start to the day with these Spinach Oat Pancakes! They don't just look nice, they taste real good as well! In a grinder jar pulse the oats to powder. 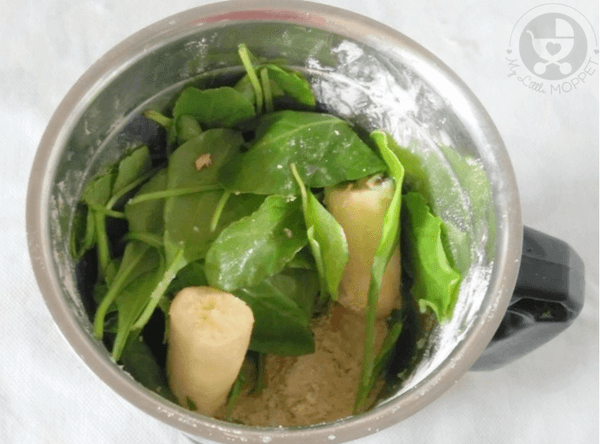 Add washed spinach leaves and tender stems along with over ripe banana to the same grinder jar. Pulse 3-4 times, to get a smooth batter. Add water as required. The batter should be not very runny, nor too thick. It should resemble a dosa batter. Heat a non-stick pan. Drizzle some oil. 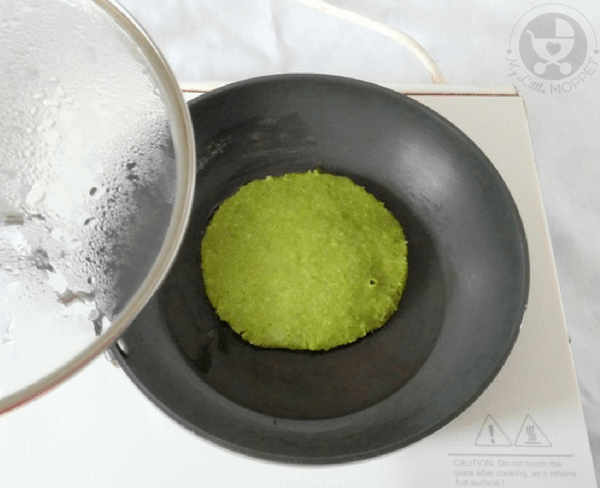 Put a ladle full of batter in the center and allow to spread. You may flatten it slightly with the back of the ladle. Do not spread much. Cover and cook. The pancake will rise a little. Flip the pancake when light bubbles start to form. Cook the other side uncovered. Make all the pancakes similarly. Serve warm with some honey or as it is. This should not be served with honey for babies under one. Please add this disclaimer. Otherwise, I can’t wait to try this with my little one! I’m going to use infant oat cereal. Thanks!! 🙂 Yes, that’s for older kids. Am I the only one confused by the measure of a bowl? What size bowl? It depends dear, that’s why not mentioned. You can take 200 ml cup. Can we save the batter for 2-3 days in refrigerator ? How can i prepare these please. 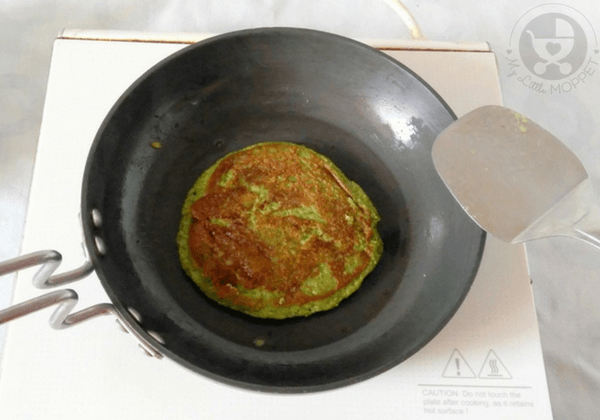 For preparing Spinach Oat Pancakes. 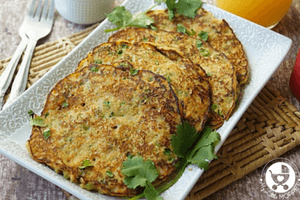 The ingredients used are 1 1/2 bowl quick cooking oats,2 cups fresh spinach,1 over ripe banana and Oil for making the pancakes. 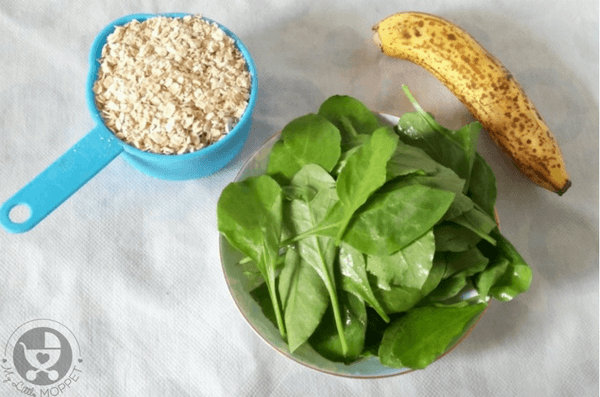 First grind the oats into a fine powder using blender and then add spinach and banana. 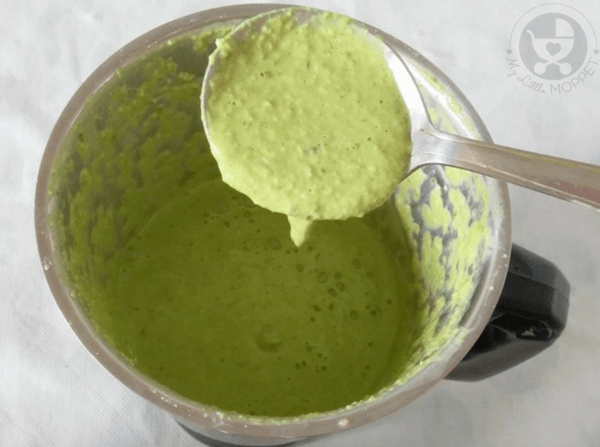 Grind the mixture by adding water till you receive a smooth batter. Keep a note that the batter should be not very runny, nor too thick. Drizzle some oil in a pan, pour the mixture and cook on both sides. 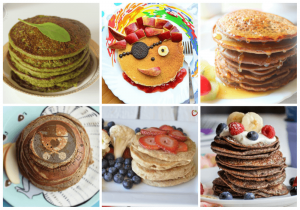 You will receive your Spinach Oats Pancake recipes for babies. 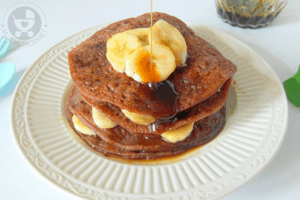 There are many pancakes recipes in our blog. So you can check our blog for recipes. Hi Hema it looks very nutritious.. will adding spinach leaves directly have any raw smell? No dear, no smell. Yes rather nutritious. Yes you can dear however you must ensure that the baby has tried everything separately before.